Goldsboro - Mr. Marcus Jamal Wiley, 32, passed on September 24, 2018. Arrangements are incomplete at this time. 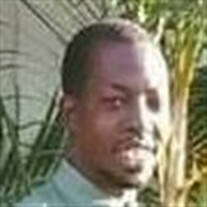 The family of Mr. Marcus Jamal Wiley created this Life Tributes page to make it easy to share your memories. Send flowers to the Wiley's family. © 2019 J.B. Rhodes Funeral Home & Cremations, Inc.. All Rights Reserved.